Changes are afoot. Over the coming weeks and months consultation days, workshops and in-services will be taking place for teachers of English in preparation for the new Junior Certificate syllabus in September 2014. Although we know much of what is coming down the line, there is still much we do not know. However, even when the new syllabus has been clearly laid out, it is still hard to know how we should prepare our pupils for the future. Societies have always changed and evolved but there can be little doubt that our current generation of pupils are living through a massive explosion in technological ability. The development from the home PC to Smart phone to tablet to Smart watch to Google Glass in roughly ten years has been staggering. A first year pupil that starts secondary school in September 2013 and completes a typical four year degree will be entering the work force in 2022. What job will await them? More importantly, what skills will they need? 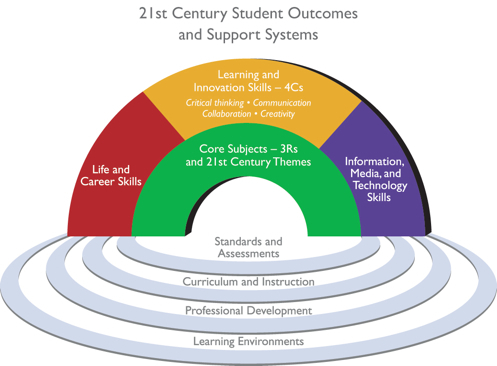 One model for 21st Century learning put forward by the American based group The Partnership for 21st Century Skills. Last year I found the site Kidblog. I was due to start Media Studies with my third years. I researched the site and found that it was free to use (for a generous limited amount) and had great teacher privacy controls. I found it really engaged the pupils in the course work and helped collaboration and creativity. On a very practical level, I think the pupils found it a very useful revision source come exam time. At the end of the section I wished we had blogged/kept an e Portfolio in more sections than just Media Studies. one subject may arise as teachers and students become more familiar with the process over time.'. This year I have started to keep an e Portfolio with a 5th year English class. Although their work will not be exclusively done in electronic form, I hope it will give pupils of all abilities a better chance to create and collaborate. I hope to report back later on in the year with how we are getting along.